Get inspiration from the hottest design trends happening now—from retro themes to patriotism, hobbies, food and more. 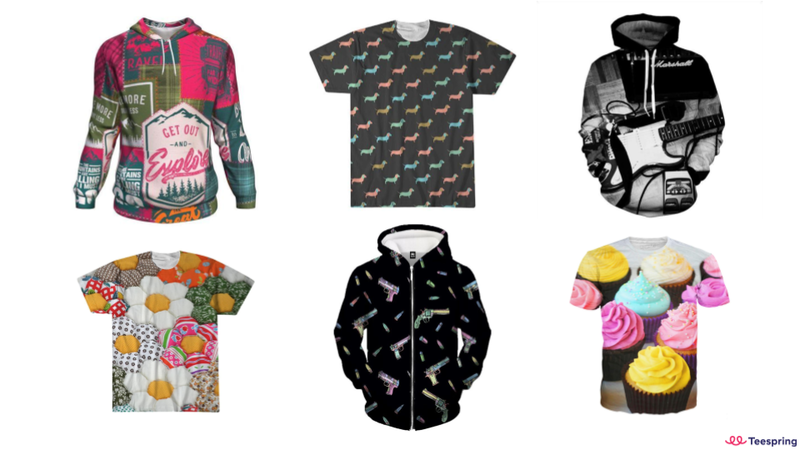 Unleash your creativity with our new all-over print tees, zip-up hoodies and other print on demand products. Check out our quick video tutorial below on how to create custom patterns to apply to these exciting new products now. Add a modern twist to your most popular niches. Check out these examples of how you can convert popular design themes like travelling, shooting, music, quilting, baking, and pets into all-over print patterns. 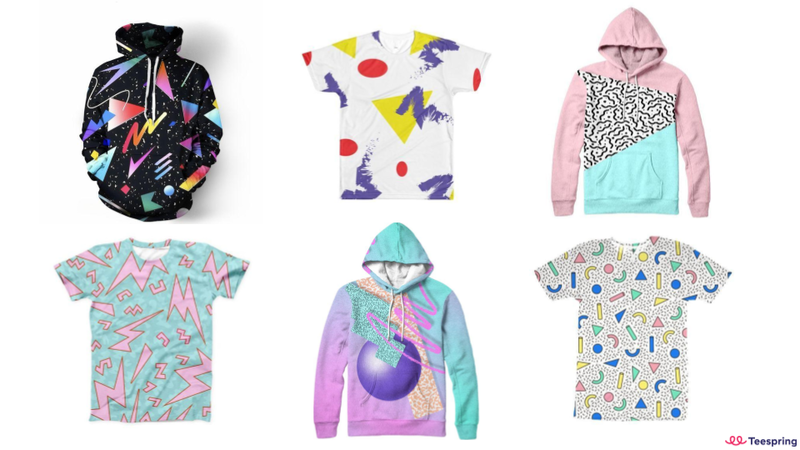 The 90’s are back in a big way—with bold, geometric prints! The bright colors and simple shapes make this an ideal design for sublimation prints. Oversized, all-over repeating patterns are especially popular for this design theme. We’re seeing more and more vaporwave-style designs inspired by internet memes. These types of designs tend to feature vibrant computer-generated colors and graphics. Patriotism never goes out of style. 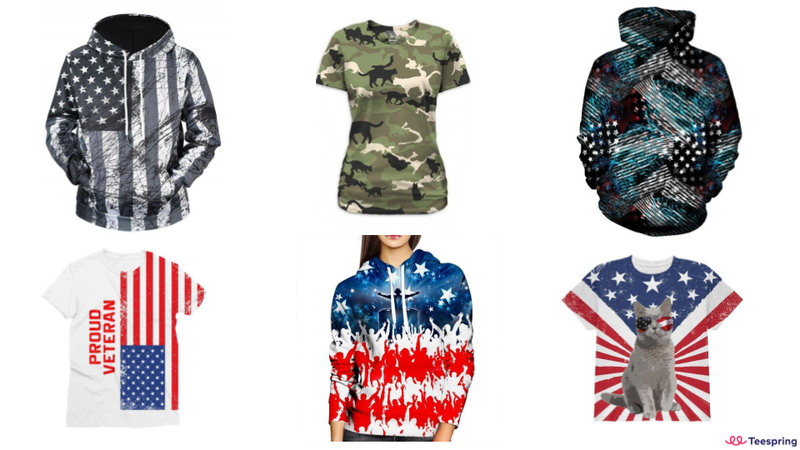 American imagery, military branches, and anything with stars and stripes is sure to garner mass appeal from American shoppers. Just keep copyright and trademark laws in mind as you create new designs. For example, no design can feature official military branch logos. If your design has text you should avoid the words (or variations of) “marine” and “coast guard”. Also, don’t add “US” before any branch of the military in your design—ex. you cannot have a design featuring the text “US Army Veteran” but you could have a design featuring “Army Veteran”. 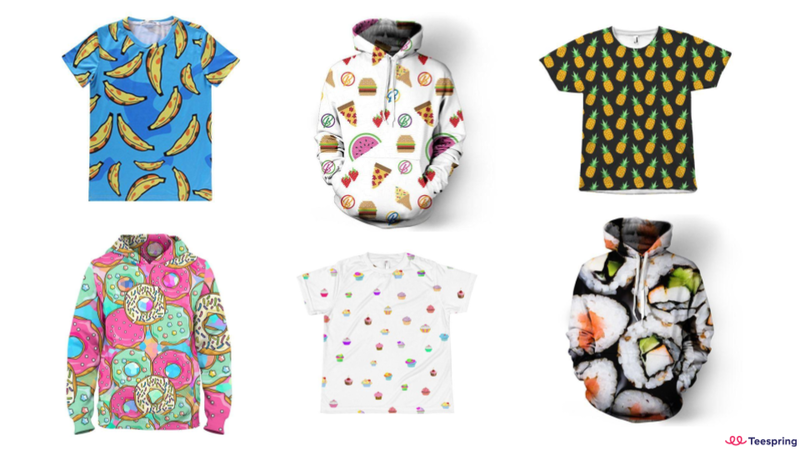 Food patterns are universally popular and show off the wearer’s unique interests and style. These quirky, bright prints are a favorite of Gen Z and a growing trend in global marketplaces. Our trends expert Laura Ewing predicts tie-dye prints will see a major comeback in 2019. 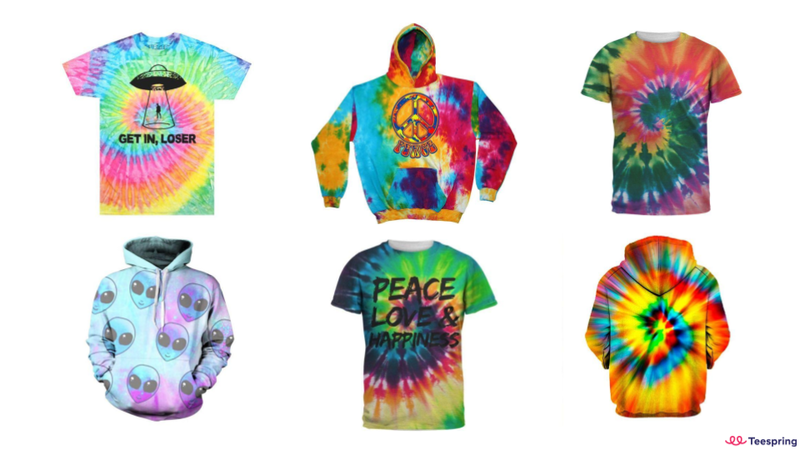 For further customization, tie-dyed multicolored backgrounds can be combined with other design elements for a truly one-of-a-kind product. 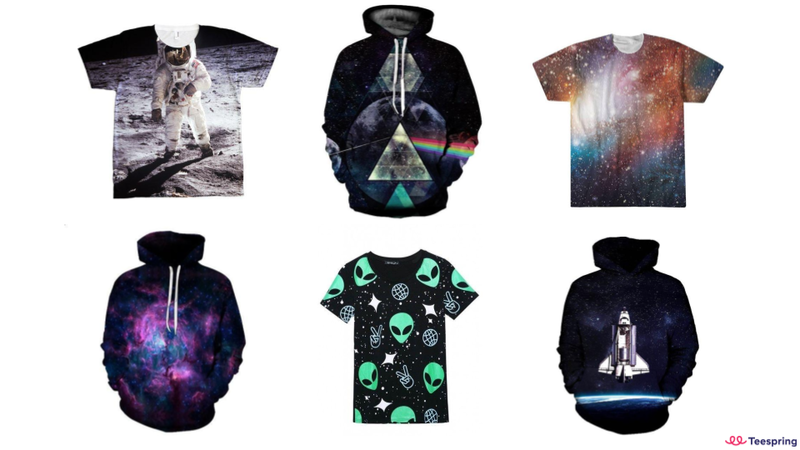 Space design themes like astronauts, space crafts, nebulas, galaxy textures, aliens, UFOs are trending in most marketplaces already! Explore your creativity and create some far-out design concepts even extraterrestrials will love. 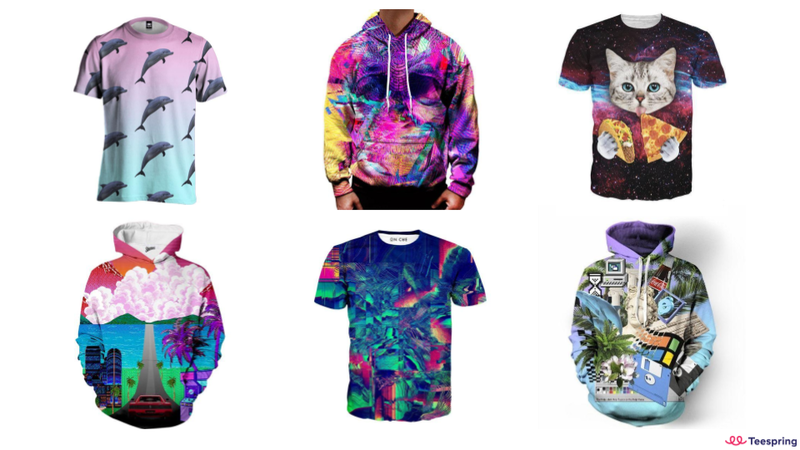 Even if you haven’t unlocked all-over print apparel yet you can still access several sublimated products like pillows, leggings, canvas prints, phone cases, blankets, and more. Get inspired by these popular design trends and start creating all-over print products now. This is really nice… I just make my first 22$ from teespring and with zero cost and I like it,,, a few days ago I spent more than 100$ advertising on Facebook with no results, maybe if I had this all over thing I would make more. This overall pattern idea fits with a dream I have been having for a shirt. But the idea I have would require some text overlay on the overall pattern. I’m sure you can do that but I didn’t see any examples so I wanted to ask you about that. BTW, the font size on this msg is way too small! I can barely read it. Hey Stan, you can definitely add text to these designs! i made four sales so far with tee spring and its fun i use this to drive and little extra income i could use during my spare time .. the fact is i like to make my own hours and days to work online .. my question to those who have had more success with tee spring what else can i do to drive more sales online.. I world like to know as well because i only made 2 sale so far and i want to know what everyone is doing, im on ig,fb,pinterest, even a blog any ideas?????? I want to learn how i makes that?! Hey Mahmoud, check out the link here for more information. Hi. i don’t see the option of all over print design. when will i get my listing? Hey Mohammad, we’re rolling these out on a case by case basis before releasing it to the masses. To better your chances of being selected early, be sure to maintain a good trust score and try to boost your sales! This is what I was hoping Teespring would make available. This will definitely allow for some better designs.